Robbin Watson Mangano recently moved to the Boston area from San Diego, but New England sights are not unfamiliar to the Connecticut native. The 28-year-old said she didn’t realize what was in her own backyard until she left the East Coast, and seeing Instagram posts from accounts back home inspired her to move back here with her husband about two years ago. 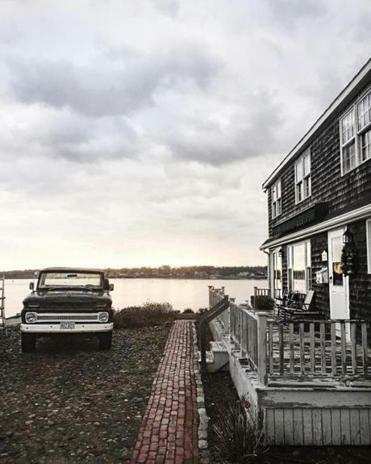 Mangano showcases the beauty she’s found in New England landscapes, architecture, and coastlines on her account @robbinwatson. Q. When did you get into photography? A. I was taking photos when I was in San Diego but they were more about my life working in public relations. From there I moved to New England, and that’s when I put a focus on my account and really honed in on New England, specifically the landscape, architecture, and I love to feature the New England coastline because I don’t think a lot of people outside of New England know about how stunningly beautiful the beaches are here. Q. What do you look for when you’re composing a photo? A. I really love to focus on the old homes in New England. I used to live in Charleston, S.C., and people there always brag about their history. I love to show that American history really started here in New England. There are homes historically preserved, so what I do when I go out is I try to seek out older pieces of architecture to feature in my photos. You’ll rarely see me feature anything modern. Q. Why do you think people like your images of homes? A. Pictures of these homes takes you out of your day-to-day life and brings you to a different time. I am a huge history nerd and I love to see these homes with plaques on them that say the house was built in the 1700s [or] 1800s. I imagine what that street looked like at that time and I think it helps people take a look at what their neighborhood or town used to look like and how it has grown. When you get a house that has lasted for 300 years, you think of the work that went into sustaining it, and the high quality work it took to make it last that long. Q. Any standout experiences from when you’ve gone out to take photos? A. I really enjoy highlighting the town I live in. I’ve had friends reach out to me saying they want to move here now since they’ve seen these photos. It seriously warms my heart when people comment on my photos of Scituate, relaying how happy they are that I’m sharing these images because they’d forgotten the beauty of it. Seeing that makes me appreciate where I live and the beauty of my home. That is what really pushes me to continue taking photos, especially with where I live in the South Shore, highlighting the coastline, and the super-old homes that are so stunning. I love to be able to give this area a new look that people may have forgotten about.